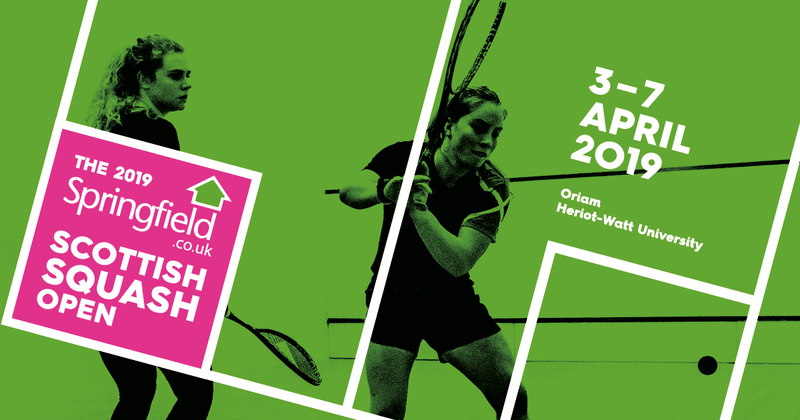 The Scottish Open, last played in 2001, now has a title sponsor in Springfield and takes place at Oriam – Scotland’s Sports Performance Centre at Heriot-Watt University – from Wednesday to Sunday. It is a Professional Squash Association (PSA) Challenger 10 event with a $20,000 prize fund which will be equally split between male and female players. The tournament has attracted some big names from Britain and further afield with Lucy Turmel of England top seed in the women’s draw and Scotland’s Alan Clyne number one seed in the men’s event. Fourth seed Alison Thomson, Carrie Hallam, Lucy Murchie, Georgia Adderley and Katriona Allen are the Scots’ females involved with Clyne joined in the men’s draw by Rory Stewart, Chris Leiper and Fergus Richards. All of them have trained or do train at Oriam in Edinburgh on a regular basis making use of the cracking facilities, so to get to play a competitive tournament on ‘home’ turf is something very exciting. University of Edinburgh student Adderley, 18, is due to face Alicia Mead from England in round one at 2pm on Wednesday and the former Scotland age-grade football player said: “It is really great that the Scottish Open is making a comeback and I know all the guys who train at Oriam cannot wait to play in a big tournament there. “It is great that the prize fund is to be split equally between men and women too, a number of squash events are doing that now which is really good and leading the way really. Thomson, who awaits the winner of that match in round two on Thursday, has been in great form in the early part of this year. The 22-year-old finished runner-up in the British under-23 Open in January, beat Hayley Mendez of America – a former world 42 – at the Cincinnati Cup in February and reached the final of the Swedish Open last month. “Things are positive just now and I’ve trained at Oriam many times, but it will be a new experience playing in front of a crowd,” she said. In terms of the men, well wildcard Fergus Richards just cannot wait to get going. “I’m really excited about competing and I can’t wait to get out there,” the 23-year-old who plays Matias Tuomi from Finland in round one at 1pm on Wednesday said.